Under even mild conditions stock brake hoses expand with every push of the brake pedal. This condition results in a soft pedal, reducing the efficiency of your brake system. In addition, when introduced to the rigors of racing, stock hoses can leak or burst. 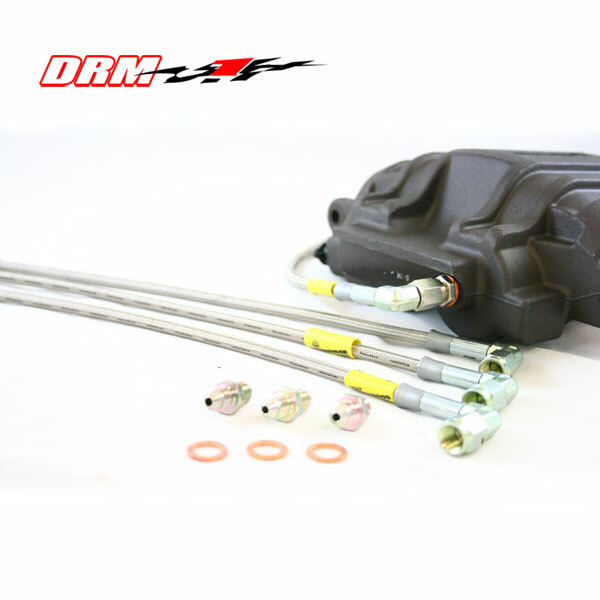 DRM’s braided stainless steel lines are designed to handle the demands of racing by also transmitting maximum fluid pressure to the calipers. Results are improved braking, a firmer pedal and increased driver confidence. Please note, we don’t use factory style banjo fittings and bolts due to the risk of them getting knocked loose during track and high performance driving. Kit includes: 4 Lines, 4 Adapters, 4 Washers. If you have a special application please contact our sales department. We know brake systems!! !